Want to treat someone to an extra-special breakfast? 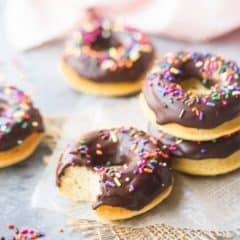 Make these chocolate frosted donuts! An easy recipe that will make their morning! The school year has started! Yay! At this time of year, I start to think a lot about homemade breakfasts for my family. There are plenty of cold cereal mornings, don’t get me wrong. But I like to give them options. Some of their favorites include these Homemade Waffles and this Granola (for my older guy). The younger one is a chocoholic, so these Chocolate Chip Muffins are one of his top favorites. And he LOVES him a chocolate frosted donut. Whenever we go to the grocery store together, he always begs for one from the bakery section. 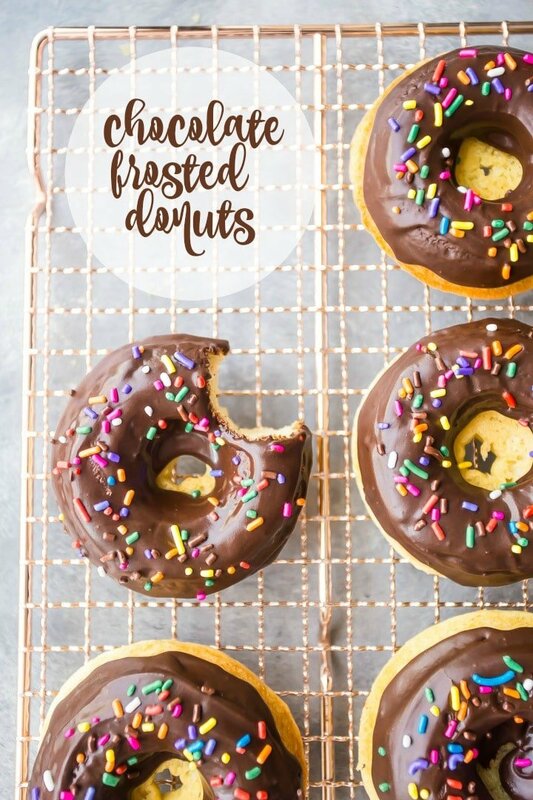 So when I really want to give him a treat, I’ll make these homemade chocolate frosted donuts. Aren’t they fun? There’s something about all that luscious chocolate icing, and those colorful rainbow sprinkles, that just makes his face light up. I totally get it! Homemade donuts sound like they’d be a real pain to make, but this version is SO EASY. They’re baked, so you don’t have to mess around with hot oil or anything like that. And the batter comes together in a snap. It’s basically just a quick bread (similar to a muffin), so it’s just a matter of putting your dry ingredients in a bowl, whisking your liquid ingredients together, and then combining the two. The dry ingredients are flour, baking soda, and salt. Just whisk them together to combine. Measure your oil in a large liquid measuring cup, and add the sour cream, sugar, egg, and vanilla. Give it a good mix, and then pour it in to the dry ingredients. Fold everything together until just barely combined. If you overmix, your donuts could come out tough. We want pillowy, tender donuts, so just give it a few quick strokes! It’s best if the batter looks a little lumpy. The key to the whole thing is the donut pan. I have this donut pan, and I love it. I do like to give it a little mist of non-stick spray, just for added insurance. We don’t want any donuts sticking to the pan! Just spoon the batter into each of the six wells and bake! You’ll know the donuts are done when they feel springy and they’re starting to look a little golden brown around the edges. SHOULD THESE DONUTS BE FRIED? This is a recipe for BAKED chocolate frosted donuts. There is no yeast, and you can make them without frying them in hot oil. If you’re looking for a yeast donut recipe, check out these Biscoff Donuts. I’m not sure if this recipe would work in the fryer, because the batter is probably a bit too loose. 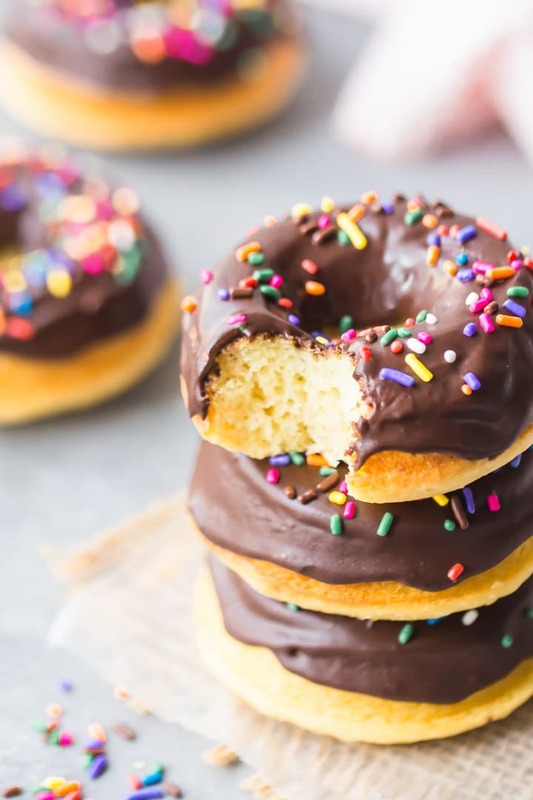 The chocolate glaze is what makes these donuts so special. It’s just as easy to make as the doughnuts themselves, if not more so! Just stir powdered sugar, cocoa powder, and milk together in a small bowl. The icing will seem very thick, and that is just what you want. If it’s too thin, it will soak into the donut and you’ll just have a wet donut. Whomp, whomp! So just keep stirring, even though it seems too dry to ever come together. If you need to add a little more milk, just do so a drop at a time! You really don’t need much liquid at all to make a spreadable chocolate donut icing. WHAT OTHER TOPPINGS CAN BE USED? If you’re looking for other options, check out these Strawberry Donuts, these Glazed Donuts, and these Crumb Donuts. Or if you’d prefer a chocolate cake donut, try this recipe: Baked Chocolate Donuts. 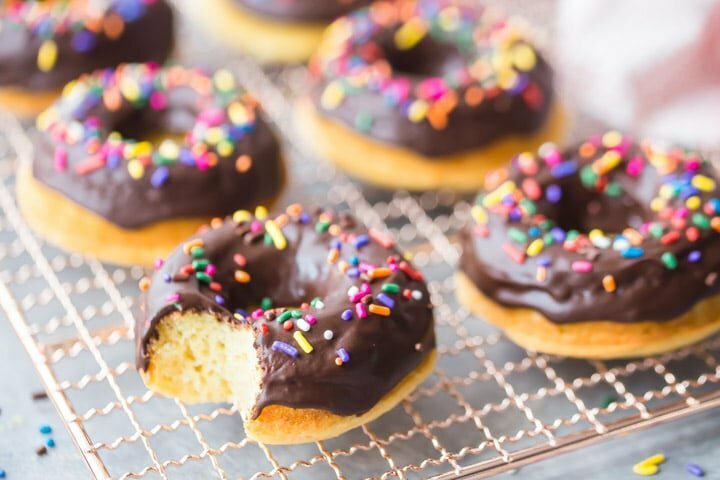 Donuts are super versatile; there’s tons you can do with them! Top them with whatever your heart desires. You’re only limited by your own imagination! HOW LONG DO THESE CHOCOLATE FROSTED DONUTS LAST? If they aren’t gobbled up on day one, lol! Just place them in a large container, in a single layer if possible. If you can’t fit them in a single layer, you might want to put parchment or wax paper in between. Cover them, but do so LOOSELY. If they’re completely airtight in there, they tend to get soggy. The chocolate frosted donuts will keep this way, at room temperature, for about 2 days. Or, you can put them in the refrigerator for about a week. You can probably freeze them too (they’d last several weeks in the freezer), but just be aware that the frosting and sprinkles could weep or run as the donuts thaw. If you really want to start someone’s morning off with a smile, make them these chocolate frosted donuts! They’re such a fun & cheerful breakfast treat. Place the flour, baking soda, and salt in a large bowl and whisk to combine. Place the oil, sour cream, sugar, egg, and vanilla in a smaller bowl and whisk until smooth. Pour the liquid ingredients into the dry and fold together until combined (batter will be lumpy). Transfer the batter to the prepared pan and bake for 13 to 15 minutes, or until a toothpick inserted in the thickest part of a donut comes out clean. Cool completely, top with chocolate icing, and garnish with rainbow sprinkles. Place the powdered sugar, cocoa, and milk in a small bowl and stir together until smooth. This exact donut is my girl’s favorite! We always purchase ours but now I’m going to try making at home. Thanks! I love that this has such simple ingredients- things I always have in my cupboard and fridge! Saturday morning cant’ come fast enough – a dozen of these will be happening!